The South Pole, also known as the Geographic South Pole or Terrestrial South Pole, is the southernmost point on the surface of the Earth with the Antarctic continent. It is the site of the US Amundsen-Scott South Pole Station, which was established in 1956 and has been permanently staffed since that date. Follow in Amundsen's footsteps journeying to the harsh yet beautiful South Pole. The Geographic South Pole is defined for most purposes as one of two points where the earth’s axis of rotation intersects its surface (the other being the Geographic North Pole). The projection of the Geographic South Pole onto the celestial sphere gives the south celestial pole. The Ceremonial South Pole is an area set aside for photo opportunities at the South Pole Station. It is located a short distance from the Geographic South Pole, and consists of a metallic sphere on a plinth, surrounded by the flags of the Antarctic Treaty signatories. 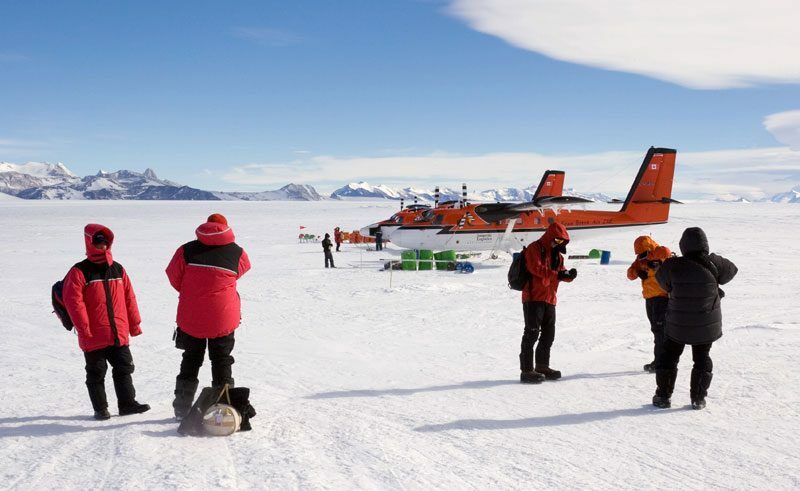 The ceremonial marker is not moved each year, so its position relative to the Geographical South Pole slowly changes over time as it drifts with the ice. The first humans to reach the Geographic South Pole were Norwegian Roald Amundsen and his party on December 14, 1911. Amundsen named his camp Polheim and the entire plateau surrounding the Pole Haakon VII’s Vidde in honour of King Haakon VII of Norway. Amundsen’s competitor Robert Falcon Scott, with four other men from the Terra Nova Expedition, reached the Pole a month later. On the return trip Scott and his four companions all died of starvation and extreme cold. In 1914 British explorer Ernest Shackleton’s Imperial Trans-Antarctic Expedition set out with the goal of crossing Antarctica via the South Pole, but his ship the Endurance, was frozen in pack-ice and sank 11 months later.